“If any of you lack wisdom, let him ask of God, that giveth to all men liberally, and upbraideth not; and it shall be given him” (James 1:5). If any of you lack wisdom. There is no “if” in the matter, for I am sure I lack it. What do I know? How can I guide my own way? How can I direct others? LORD, I am a mass of folly, and wisdom I have none. Thou sayest, “Let him ask of God.” LORD, I now ask. Here at Thy footstool I ask to be furnished with heavenly wisdom for this day’s perplexities, ay, and for this day’s simplicities; for I know I may do very stupid things, even in plain matters, unless Thou dost keep me out of mischief. I thank Thee that all I have to do is to ask. What grace is this on Thy part, that I have only to pray in faith and Thou wilt give me wisdom’. Thou dost here promise me a liberal education, and that, too, without an angry tutor or a scolding usher. This, too, Thou wilt bestow without a fee — bestow it on a fool who lacks wisdom. O LORD, I thank Thee for that positive and expressive word “It shall be given him.” I believe it. Thou wilt this day make Thy babe to know the hidden wisdom which the carnally prudent never learn. Thou wilt guide me with Thy counsel and afterwards receive me to glory. 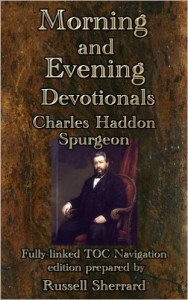 If you would like your own copy of Spurgeon’s Morning and Evening Devotionals by Charles Haddon Spurgeon click the image below.